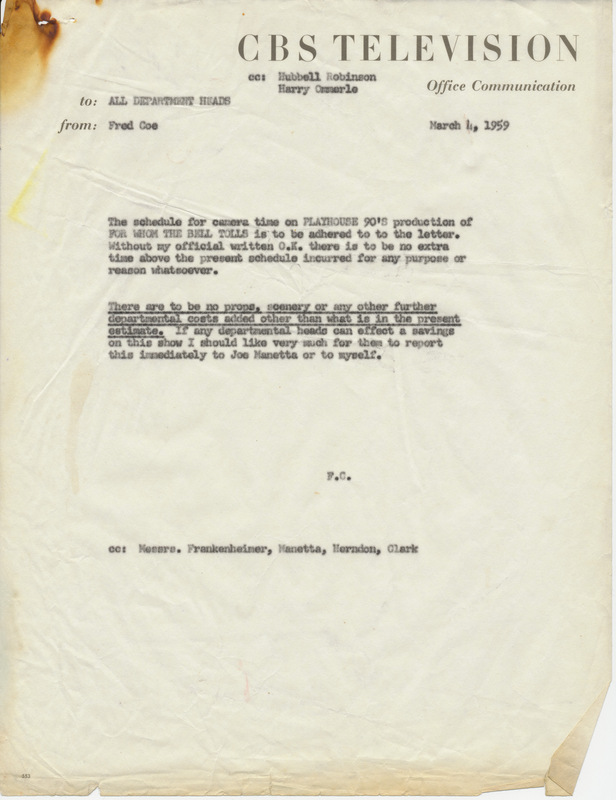 The Fred Coe papers include several folders of production documents concerning "For Whom the Bell Tolls," a Hemingway adaptation that spanned two episodes of Playhouse 90 in March 1959. The extraordinarily ambitious teleplay by A.H. Hotchner called for battle scenes, horses, ruins, and hundreds of extras. To accommodate all of this, Coe arranged for the use of four of CBS's New York studios. 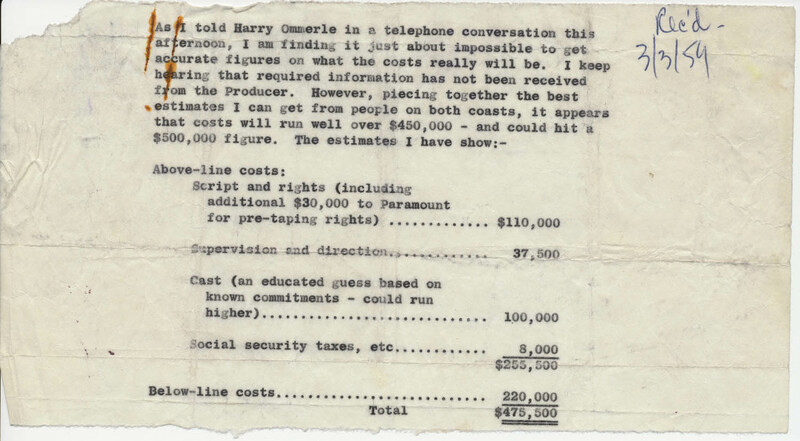 One of his early budget estimates was nearly $500,000, but still the production went $20,000 over budget a full three weeks before broadcast. Coe fired off dozens of memos urging staff to keep tight control over their expenses. Other documents chronicle the attempt to find "name" actors for the major roles without exploding the budget. Maria Schell, fresh off M-G-M's film The Brothers Karamazov, was given $20,000 and a short haircut . Jason Robards received $17,500, while the then-unknown Sydney Pollack made union scale. The 29-year-old Frakenheimer, already one of the most respected artists in live television, was hired to direct. The show was heavily publicized in advance of its airing, with Life Magazine sending Alfred Eisenstaedt to photograph rehearsals and gossip columnists covering Schell's haircut. In a sardonic memo, Coe complained that the $50 cut could have been done for $10 or $15. 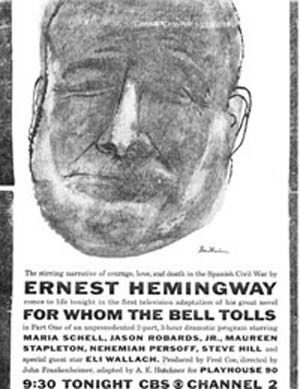 A full-page ad for the shows, featuring a stylized portrait of Hemingway himself, graced many newspapers. The WCFTR documents on this episode also reveal the role of the blacklist in 1950s television. A leading character actor, Ludwig Donath, was approached by Frankenheimer, who offered him a part. However, before Donath could be formally cast, the network informed his agent that he was, in fact, "not 'employable.'" Donath, in a series of letters written to Coe before and after the show's air date, alludes only to a "strange and illogical reason" for this turn of events. In fact, Donath was blacklisted because of his left-wing associations. However, the influence of the blacklist was waning, and Donath was able to resume his career in television and, eventually, film later in the year. Like other late episodes of Playhouse 90, "For Whom the Bell Tolls" was partly shot on videotape. 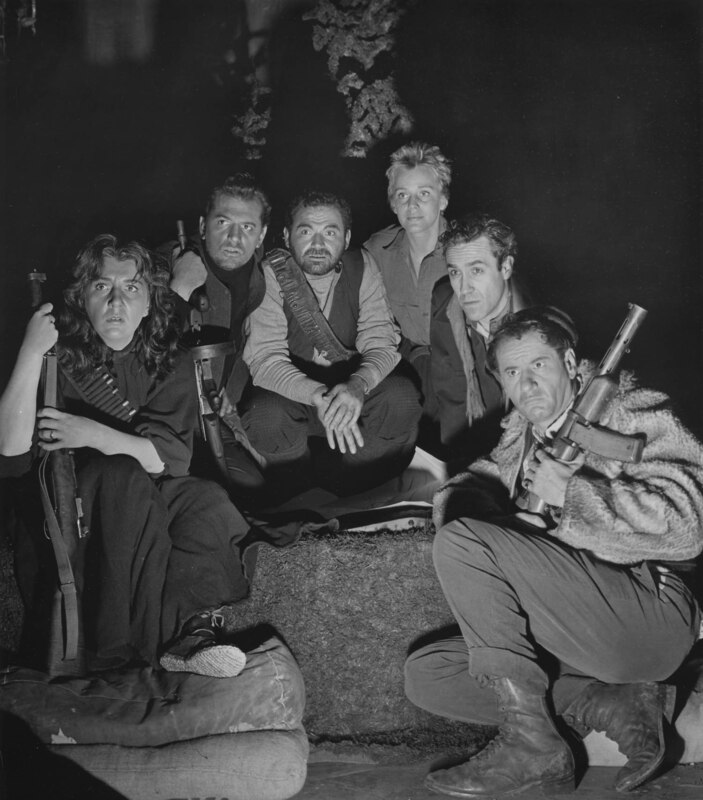 The network was prohibited from shooting the entire production on tape—which would have facilitated rebroadcast—by the terms of the licensing agreement with Hemingway. 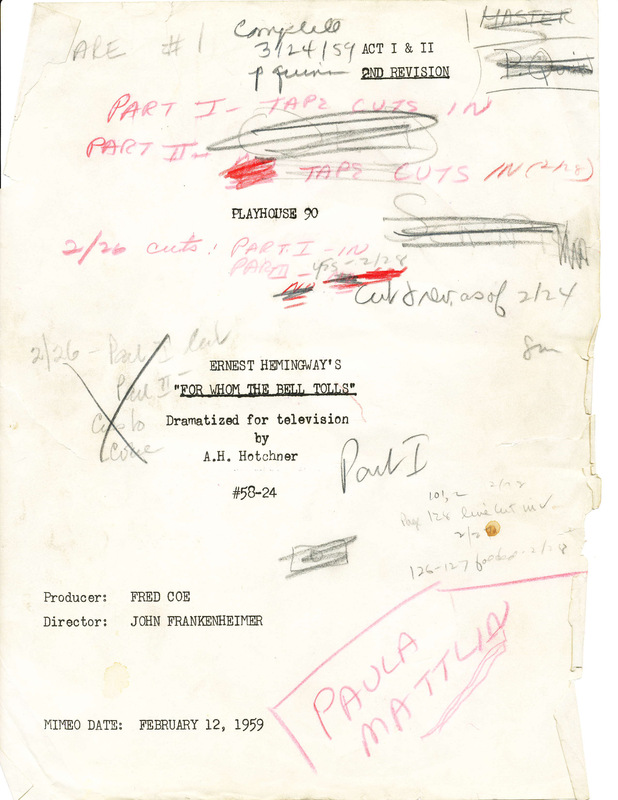 The cover to Coe's copy of the shooting script notes, in red ink, when "tape cuts in." The reviews were mixed: critics expressed admiration for the show's "experimental" scope and ambition, but many felt these qualities overwhelmed the human drama. 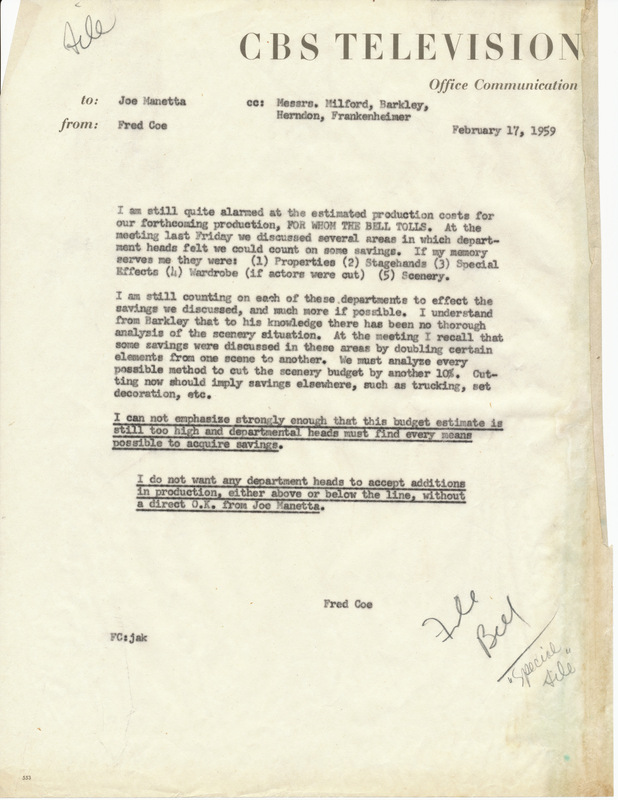 Critics mostly approved of Hotchner's decision (motivated, no doubt, by the realities of writing for national television) to tone down the "partisan" qualities of Hemingway's novel and concentrate on the "human drama." This recalls a frequent criticism of the Golden Age, that its vaunted "hard-hitting" stories were often limited by political caution.